Untersuchungen zur deutschen Literaturgeschichte ; Bd. 109.
vii, 450 p. ; 22 cm. Jewish aspects are treated secondarily. Includes bibliographical references (p. 427-450). German literature--Foreign countries--History and criticism. German literature--20th century--History and criticism. 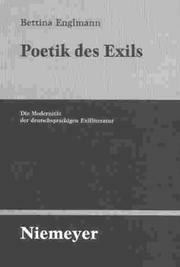 Exiles' writings, German--History and criticism.